India, as a predominantly rural economy, has much to look forward to in the area of agriculture to seed the economic progress of this nation. However, agriculture related policies do not dominate political discussions and the apathy towards this sphere is apparent in the drought situation faced by the nation most recently (2015-16). Dr Yoginder K Alagh, who is Professor Emeritus at Sardar Patel Institute of Economic and Social Research in Ahmedabad and Chancellor of the Central University of Gujarat, provided some insight into the mechanics of agriculture leading the way to India’s fiscal development at the International Centre Goa, Dona Paula. Speaking on the future of Indian agriculture, Dr Alagh expounded that a perspective is needed in terms of agricultural development. The planning commission has been abolished in lieu of Niti Aayog which has its own policies. Though the Niti Aayog has been asked to develop a perspective in terms of agriculture, the common complaint Dr Alagh has encountered in Delhi from the concerned ministries is that funds are not available. There is much scope for universities and research institutes to look into long-term problems in agriculture. The context provided for the future of agriculture is population growth, food security and consumption, inflation, food demand and the fact that the rich and poor are equally dependent on the produce from agriculture. India is fortunate in that its economic movement is spread across the country and not concentrated in one particular area. Speaking about investment in agriculture, Dr Alagh says, ‘We have very high rates of investment in agriculture but very low rates of growth.’ The physical output of agriculture is important as it contributes to employment opportunities. In the days past, agricultural growth was at about 4% with more of yield growth as compared to area growth. Food grains growth remained stunted while non-food grains increased. ‘So we were diversifying. These were good things that were happening,’ says Dr Alagh. There was a shift in the scene in 2014-15 when the CSO (Central Statistical Organisation) and the Finance Ministry predicted that the growth rate would be 1.1%. But it was not to be so with the growth rate being -0.2%. This year too, the growth rate is to be 1.1%, nonetheless Dr Alagh says, ‘I don’t think we should worry too much about it because these have been bad years.’ He warns that it cannot be dismissed altogether either. 4–5% is the highest growth rate achievable in any country (over more than a decade) and India would do well to reach 4–4.5%. ‘I’m going to posit that Indian agriculture is going to meet the requirement of food security and rapidly diversify,’ says Dr Alagh. It will function in a rural-urban continuum with rapid development of markets and people migrating from villages to towns and moving from crop production to value added production. These changes will lead to a surge in growth and employment. We need technology, organisational support, economic support in terms of infrastructure and pricing. The terms of trade do not seem to back agriculture to a large extent. In the 1990s detrimental terms of trade were turned around to favour agriculture by 14% (over a decade). In recent times the terms of trade have moved down by 4.5 points (2010-2014) but Dr Alagh does not deem this a serious issue. Where population is concerned there are more young people as compared to old which means more youthful energy to develop agriculture. Urbanisation will continue although there will not be substantial development of big cities. Small to medium towns and smart cities will be the focus with special concern for market town development. Market towns will drive Indian urbanisation. ‘But we don’t include agriculture in them and we don’t even call them towns. I see a problem in that which involves politics,’ says Dr Alagh. The rate of urbanisation in India has been growing quite slowly. The main increase in this urbanisation has taken place in census towns. A census town is a town according to the definition of the census. 75% of the population here works outside of agriculture. The government does not want to name them as towns because of the political advantage of having panchayats in those areas. Hence, it lacks the necessary infrastructure and dynamic activities that take place in agriculture. 4 crore people have moved to these towns chasing agricultural demand but end up supplying the produce of animal husbandry, and vegetables and fruit. India has the widest spread of markets in South Asia. India will grow fast with growth investment and productivity as the drivers. ‘I once made an estimate that a third of our growth will have to come from technology because we don’t have land and water. The rest will come from investment and growth in our workforce,’ says Dr Alagh. Trade will be important as we will be producing for national and international consumers. Demand of cereals like rice and wheat is not going to escalate within the country, but there will be a surge in demand for other vegetables, fruit, dairy and poultry products and meat. Thus low growth of cereals is compensated by the growth of these other products. The Krugman model for urbanisation shows an elasticity of urban growth to economic growth. In India that elasticity is 0.6% and the concentration will be in small and medium towns. Dr Alagh says, ‘We keep on using earlier forecasts and estimating that a lot of people will still remain in agricultural and in rural areas and that is not going to happen.’ People will continue to move to small towns. However, this population will continue to be slotted as rural even though they are not. Considering this sort of urbanisation, the decrease in rural workforce will be greater. We need to be prepared for these changes and have institutional backing. Investment rates in agricultural GDP is up to 18 – 20%. Nevertheless 20% rate of investment is getting us only 4% of growth instead of 6%. ‘We need to find out why. Is it that we are running short of land and water?’ The cropped area, which was constant, is falling because cities are eating into agricultural areas. One solution would be to raise the productivity of cereal growing areas. Farmers should be persuaded to expand to the production of dals, fruit, vegetables, etc, instead of rice and wheat. Places such as the Punjab, which has good soil and is well irrigated, should concentrate more on producing rice and increasing yield using hybrid varieties. This would release land for other farming and solve the land shortage problem. The rural-urban continuum consists of villages, big villages, small and medium towns. Where the markets are, there should be first stage processing, communication, computers, etc. ‘An American farmer, before he grows his paddy, knows what the Goan farmer is getting for his paddy, or the Filipino farmer is getting for his paddy. That is the extent to which they use the satellite information system. We’ve only scratched the surface here. We have some of the best satellites and computer input in the world,’ says Dr Alagh. The experiments here need to be multiplied on a larger scale. First stage processing needs to be supported by producer groups, agricultural cooperatives, and farmer agencies. The corporate sector can be a major player as seen with the success of the i-Shakti pulses of the Tata Company. A small group of farmers mixed with a producer group, in this case Rallis India, Tata’s agro-chemical subsidiary. 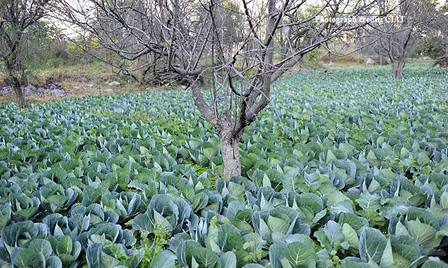 Rallis gives the farmers technological support and buys their produce. Now there are more than 500 official producer companies and there are some more that are not registered. Finance is another issue to be addressed. 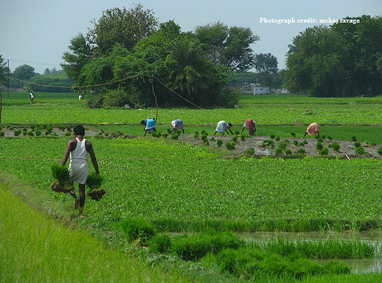 NABARD (National Bank for Agriculture and Rural Development) has brought back its scheme for financing the agro-climatic plan. The newer institutions need to be funded as well and this can be a difficult proposition. So do we open our doors to the rest of the word? Dr Alagh says, ‘There is this whole history of tea companies and colonials. At the same time there are newer ones like the Rabobank helping producer cooperatives. The Singapore company Temasek is going around acquiring minority stakes in a number of Indian companies.’ This needs to be encouraged and regulated. Dr Alagh suggests that 100% FDI (Foreign Direct Investment) in villages makes sense and the investors should be protected because returns are uncertain. With the right combination of investment, appropriate market infrastructure, use of technology and practical utilisation of land and water resources, producer groups and so on, the hardworking Indian farmer is bound to produce fruitful results that will benefit himself/herself and the nation as a whole.